Self-seeded in the cracks of the driveway. Eight Years ago we bought a foreclosed house. The flower bed was hard as Georgia clay that had never been dug and spent years baking in the heat to become a Georgia brick. The front brick bed was especially unsightly. Fresh from selling my garden center, I had sworn off anything that ever needed watering. Ever. In the words of Taylor Swift, who was probably just learning to play guitar back then: Like Ever. 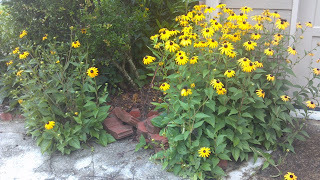 I bought a couple of black-eyed-susans in gallon pots from the clearance section of a garden center. They were $2 each. They looked pretty dead, but as you can see from the picture on the left, they have recovered! They have even reseeded in the cracks of the driveway (pic 2) and surrounded the AC unit by the back porch. All without my help. My husband has pulled out a lot. He sprays weed killer on the escapees out front. We just mow the ones that are in the back lawn. I dug some for a community garden and gave some to my mom and I STILL got written up by the HOA for having an overgrown flowerbed. Look for new growth. The plant has to be trying. You can't help somebody who doesn't want help. Same goes for plants. Check the roots. Flip it over and gently nudge off the pot. White roots mean it's healthy, just pot-bound. Brown roots are probably dead, but for some plants they are still ok. Black roots are rotten. Pinch a root and slide your pinched fingers down the root for about an inch. If the roots are healthy, you will still have a root. Unhealthy roots will come apart or the outside of the root will come off. If that happens, go wash your hands and don't buy that plant. 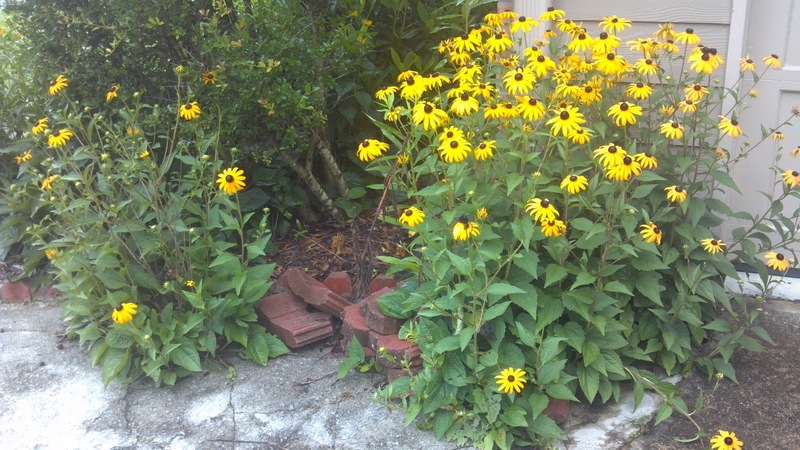 When I planted the rudebeckia into the front brick bed, I dug a hole 18 inches round and deep. I packed it and stomped it full of all the leaves the previous owners hadn't raked. Then I filled in around the plant with potting soil. I also got some undead daisy plants. The daisies are still in the black, plastic pot I bought them in all those years ago. They are sitting in the AC flowerbed which has grown enough that you can't tell they are still in their from-the-nursery container. They have rooted into the ground. It seems a shame to disturb them. Mint escaped and filled in around the daisies. It has been pulled out and sprayed with weed-killer but it didn't mind. Some joggers were discussing it when I went to get the mail. That was a good review? Wasn't it?